Today, as is the case on many summer days, Pittsburgh had a thunderstorm with lots of lightning, wind, and rain. According to the National Weather Service, there was a 59 MPH wind gust, and some places received 1 to 2 inches of rain in an hour! Where I was at, it did not appear to have rained an inch, but there was still rather heavy rain for a while. I went to check out one of the rain gardens we built two weeks ago, which is the only one that is already fully hooked up. Here's a picture (sorry for the blurriness, it was dark out due to the storm). This rain garden was so effective, that water didn't make it much further than the little creek flowing from the gutter to the rain garden area. Right now it doesn't drain the whole roof, and more water may be added to it later. Nevertheless, this is the first time I got to see a Pittsburgh rain garden in action. It was great to watch since there was a comfortable porch right next to it. I took a trip yesterday to McConnells Mill State Park, about 50 minutes' drive north of Pittsburgh. I wanted to see what non-urban forests looked like in this area and also thought it would be nice to get out of the city for a day. Click 'More' to see what I found! Yesterday I went on a mission to look for lost streams. These lost streams once flowed through the area now known as Squirrel Hill in Pittsburgh, but now are re-routed into a combined sewage-storm drain system. My approximate route can be found here. Recently I found a bunch of historic maps of Pittsburgh, on a Pitt site called the Darlington Digital Library . These maps, spanning from the early 1800s to the mid 1900s, showed the growth of Pittsburgh and, in some cases, the locations of waterways within the growin city. 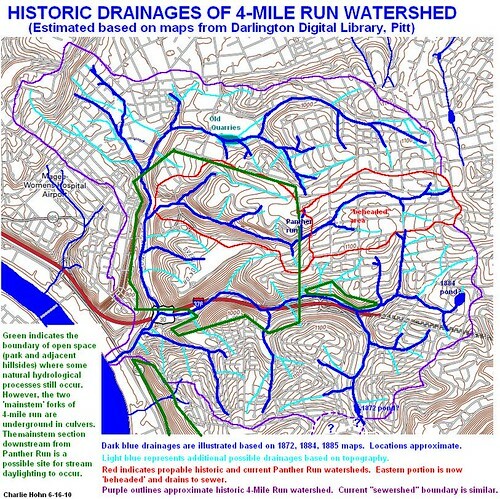 As mentioned earlier, most of the 4-mile Run watershed runoff has been routed into combined sewer-stormwater runoff channels underground. I thought it would be neat to map the old creek channels on a current map of the city, so I downloaded a USGS topo map and did just that! Click 'More' to see how it turned out. So last weekend I helped a local community organization install five rain gardens in (near?) the Highland Park area of Pittsburgh. As I've mentioned before, a rain garden is a garden intended to capture runoff from impervious surfaces like roofs and parking lots, and allow it to soak into the ground or be released back into the atmosphere. Rain gardens reduce flooding by slowing down water the way natural wetlands would, reduce pollution by naturally filtering runoff, and decrease the effects of drought by increasing groundwater recharge to aquifers that later release water into wells or springs. 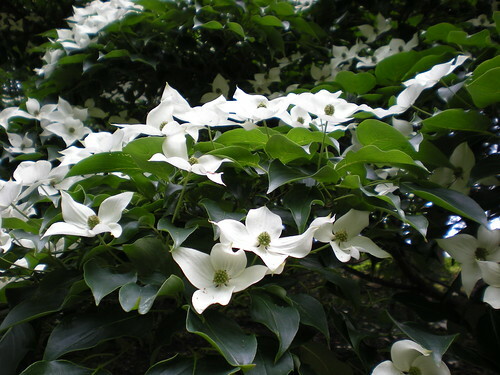 Rain gardens often use appropriately-chosen plants native to the local area, as these plants require little care and have the added bonus of providing habitat for local wildlife and beneficial insects. Note the drainspout in the background. Lawns do not absorb very much water, so whatever came out of that drainspout would rush down the hill into the gutter and then the sewer. Everyone is in a Watershed: Explorations in the Rain. One of the things I love about runoff and hydrology is that EVERYWHERE on land is part of a watershed. When it rains, or when snow melts, water anywhere on Earth has a path it will follow, either to the ocean, or sometimes to a salt lake or salt flat. Water that falls on Pittsburgh and isn't used or evaporated ends up in the Gulf of Mexico! That is about 1000 miles by road but significantly further along the twisty Ohio and Mississippi rivers. And every bit of that huge river (except rain that happens to fall in the river itself) comes from little tiny tributaries somewhere upstream (including those that travel underground in the form of groundwater). Water that falls on our construction materials, our parks, our rooftops, our gardens, our cars... it all eventually makes its way either to a river, or back into the air to fall somewhere else. Over the first week of June, as mentioned in the previous post, there were heavy rains around Pittsburgh. Over 3 inches fell between June 1 and June 5, with most of that in a few hours in two big thunderstorms. 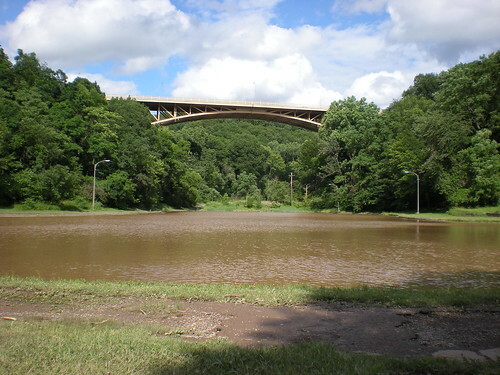 After the storms had passed, I went to Schenley Park to check out the effects of the heavy rains of the last week. There had been some fairly dramatic runoff and flooding during this time. I took a picture of this 'delta' into Panther Hollow Lake before the storms and again after. It looks smaller in the second picture because the lake level is higher. The lake had filled up well beyond its banks and almost overflowed. When I was at the lake, the water level had dropped to near normal but was still extremely muddy. 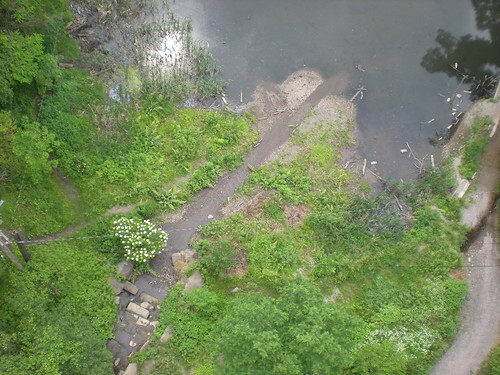 These photos are a clear demonstration of one of the problems facing this small park watershed - upstream erosion causing siltation in this lake. At some point rather soon, the lake will either have to be dredged, which is expensive, or will stop being a lake, which means people won't be able to enjoy it anymore. 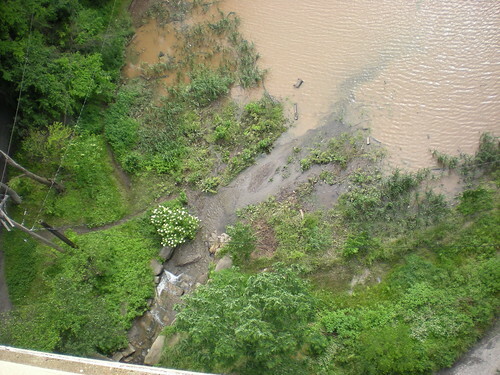 This bridge was washed out before this storm, but additional noticeable erosion had occurred during the rains. Another item of note: the atmosphere may be transitioning from El Nino to La Nina conditions. This could mean that next winter in Vermont will be much colder and icier than last winter (it may actually snow less - last winter was pretty snowy - but the snow is more likely to stick around). This would also mean a likelihood of a drier than average rainfall season in much of California. We'll see! So, there are often thunderstorms in Pittsburgh in the early summer, and this year has apparently had even more than usual. During early June there were several significant thunderstorms. The storms weren't as impressive to see moving in as those in the desert or even in Vermont, because the sky is often hazy and there are lots of trees and buildings everywhere. However, the storms were LOUD and the lightning was very impressive. and another moves in. This one lasted several hours and had a ton of lightning and rain. The storms cause lots of erosion which is a problem in the parks. Poor-quality pictures of sheet lightning from my room. There were lots of crazy bolts too but not when I was able to take videos. These storms, along with one a few nights later, dropped over 3 inches of rain on the Pittsburgh area in the first week of June. When I first arrived in Pittsburgh I went and checked out Schenley Park which will be at least the partial subject of my project. Schenley Park, and specifically the watershed of Panther Run, are the subject of a restoration and outreach project that will include habitat restoration and also will include communication with nearby residents on ways to reduce pollution in their watershed. Pittsburgh, like many old cities, has a combined storm drain and sewer system. This means that any time it rains more than about a tenth of an inch, all the water rushing into the sewer from concrete, asphalt, and rooftops, quickly overwhelms the sewer system and sends stormwater, along with gross raw sewage, right into the rivers. By taking simple measures such as using rainwater cisterns and creating rain gardens and constructed wetlands, residents can greatly reduce the amount of runoff after storms and thus the amount of sewage and pollution taht enters rivers. 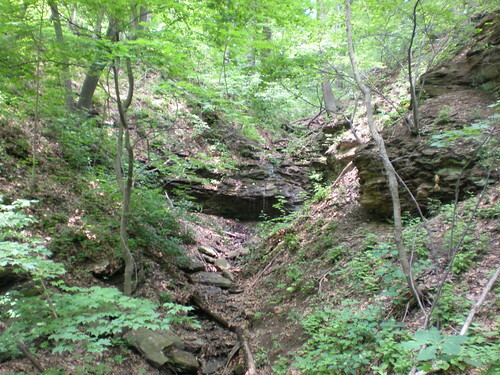 The Panther Run creek and lake act as a huge, mostly natural rain garden, and absorb much of the rain in the area that would otherwise add to polluting the rivers. In any event, here is the park. the top of a small creek. 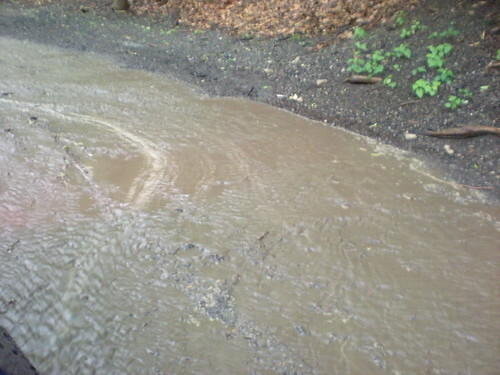 Small 'delta' created by erosion and runoff into Panther Hollow Lake. Part of the restoration effort aims to reduce this erosion, which is causing the lake to fill in with sediment. 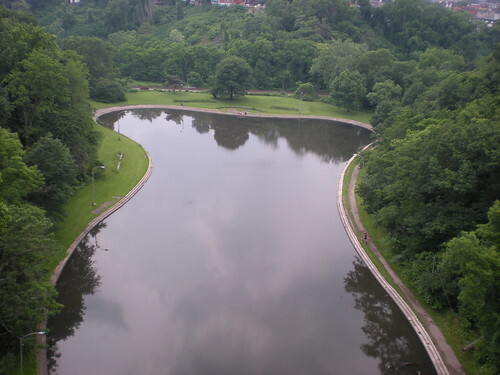 Panther Hollow Lake - although this is not a natural lake, it does serve to reduce runoff and decrease water pollution. Have you ever been in the forest during a passing summer thunderstorm? The air is warm and muggy, a sudden gust of wind stirs the trees above, and the skies open up with rain. No matter how heavy the rain is, there are a few minutes to run for shelter, because the leaves of the trees hold back the first bit of rain. Eventually the leaves are soaked, and water starts dripping on the ground. Most of this water falls on thick leaf litter, and quickly soaks into the ground. Unless it is a very heavy or slow-moving storm, not much water runs off at all. After the storm passes, which usually doesn't take very long, the trees keep dripping water for quite some time, and droplets coat the leaves in the understory. During most storms, there isn't a lot of water rushing into rivers and streams. The water from summer thunderstorms, melting snow, and spring drizzle soaks into the ground, and seeps out of springs into creeks over time. Now, imagine the same storm in the city. 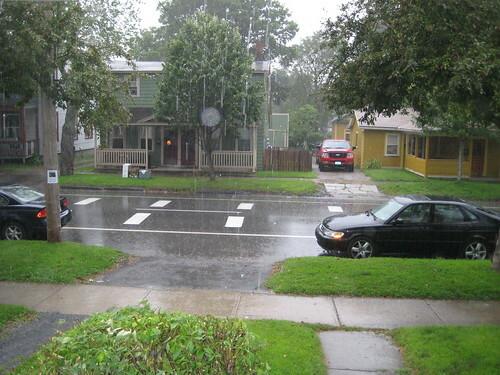 The pouring rain splashes on roofs, rushes into drainspouts, down gutters, and into drains. In some cities, these drains also contain sewer lines, and the rush of water can wash sewage into rivers and lakes. All kinds of trash, oil, and other undesirable things also wash down the gutter. A few hours later, everything has dried up. Not much water soaked into the ground, so not much water is released later from springs, either. So what's the story with 'slow water'? 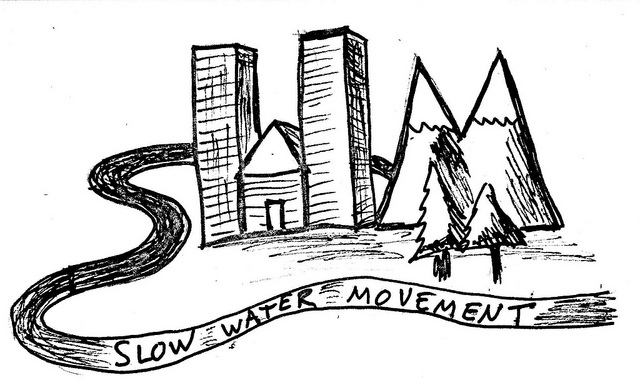 Well, first of all, this blog exists to talk about and share thoughts on how water moves - in natural areas, agricultural areas, and cities. Secondly, it exists to discuss ways YOU can slow down your water - let it soak into the ground or be used by plants, instead of going into gutters and causing pollution. And, thirdly, it addresses a bunch of very neat technology- and demonstration- based ways to share information about water, watersheds, weather, and nature with lots of different people. A lot of what I post will probably have to do with Pittsburgh, Vermont, or southern California, because those are areas I am more familiar with. Please do feel free to email me at naturalist.charlie at gmail dot com, if you have any other thoughts! And don't forget to enjoy your water! Everyone is in a watershed, and every time it rains, tiny creeks and rivers surround you!